Today I am releasing my first Christmas kit and boy is it fun! You see, I was out in the woods the other day and I ran into the most incredible sight! A family of monsters was getting ready for the annual Christmas party. They decorated trees and baked yummy cookies. I couldn't resist joining in! 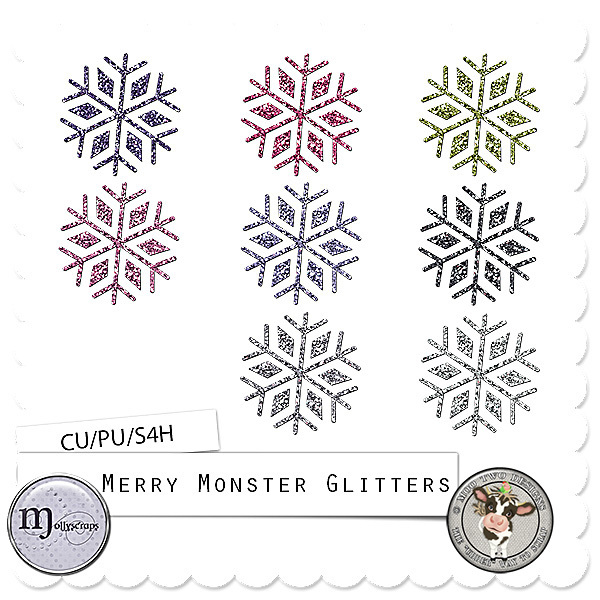 Well, I knew no one would believe me without proof so I created the Merry Monster Bash Collection so everyone would know! The kit includes 8 monsters and their goodies for a total of 24 elements (3 are recolors) and 10 papers (patterned and solid). An additional pack of 5 coordinating neutral cardstock is available as well as a CU friendly 8-pack of glitter. And finally we get to Grandpa. He wants to see what Christmas is like outside of the forest so he is coming to visit every one of you! Click the link below the preview to download him for free! Thank you for the adorable Missing Monster freebie!